1950s Science Illustration ROCKS! 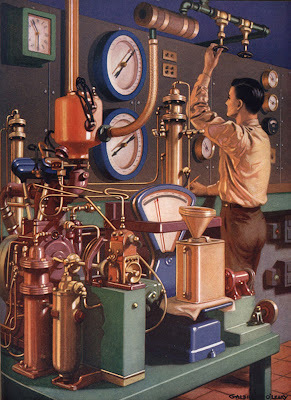 In this illustration, the well-groomed “she-male” adjusts the water intake valve (above), allowing water to flow into the red thingy, which is then dispersed into the smaller thingy’s which, when poured into the tan, spray-painted gas can with added funnel (YOU CAN'T FOOL ME!) can be weighed by the blue scale. Oops, the green clock says it’s 11:30, time for lunch and that TV Dinner! You might note that in the far distant future, science has reverted back to a vacuum-tube and heavy industry style of research. Who am I to question?